It’ that time of the year again! The skateboarding contests keep on pouring week-end after week-end. And like last year, Cowtown's 11th annual PHXAM Skateboard Contest is almost here. This year the Cowtown's 11th annual PHXAM Skateboard Contest will take place at Desert West Skateboard Plaza, in Phoenix AZ, on March 31st and April 1st. You really have to come see the top Am's in Skateboarding compete for the $3,000 first place prize. Pre-sale tickets are available here for $5. The first 500 people through the gate each day will receive a gift bag with a 2012 PHXAM t-shirt, magazine, stickers, and other miscellaneous skateboarding goods. Although practice starts on Friday March 30th for the contest participants, the public will have to wait until the gates open at 9 a.m. on Saturday March 31st to get in on the action. That day the qualifiers will kick off at 10 a.m. The semi-finals will take place later in the afternoon and the final is slated to start on On Sunday April 1st , the gates open at 10am and the contest starts at 11am as it is the Skullcandy Best Trick Contest that will be streaming live via Webcast on isTia.Tv. An Awards Ceremony will follow. The Cowtown Skateboards Phoenix Am is one contest that is known to bring out the talent. 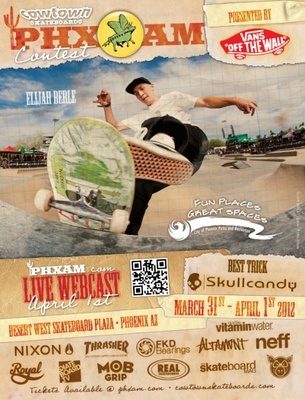 This year it is scheduled to take place at the Desert West Skateboard Plaza in Phoenix, Arizona. A whopping $3,000 1st place prize purse is on the line. As part of the competition, Skullcandy will be holding a Best Trick Contest that sports a $2,500 prize purse. Think about it, with that kind of prize money a skater can get seriously tricked out for spring. Some of the favorites and up and coming skaters are expected to participate in the event: 14 year old Gage Boyle, 22 year old Julian Christianson, Brendon Villanueva and Tyson Bowerbank. Bowerbank landed in 4th at the 2011 Phoenix Am and Boyle took 2nd at the 2011 Sun Diego Am Slam. Christianson and Villanueva both killed it all over the place as well. I'm hoping to see another incredible performance from all four in 2012. Of course they are not the only talented skaters on the list. You should also keep your eyes on are Zack "Ducky" Kovacs, and 17 year old Chase Webb. Long-time skate fans may recall Webb's performance at the 2011 Tampa Am. He finished 9th in the finals behind powerhouse Ishod Wair. Additional information about the contest, including a full list of competitors, is available on the event's website.